The 35th Annual RV and Boat show is at the convention center in Reno this weekend March 1st through the 4th. Mountain Family RV will be there with the new Basecamp as well as other RV’s. Plan to attend the show and stop by and visit our local Airstream dealer. The rally will be at Washoe Lake Nevada State Park – Washoe Valley between Reno and Carson City. Off US 395. The dates are Thursday – Sunday March 22 – 25 2007. This is an SNU rally site category 2. Cost: $5 per night per vehicle SNU kitty kall plus State Park camping fee: $14 per day per vehicle 3 day Rally, members & guests welcome. The Snu will sponsor a BBQ on Saturday at noon followed by a short Board meeting open to all. There is great bird watching in the area as well as hiking and bike trails. Arrival time – anytime after noon on Thursday March 22.
now available through Airstreamforums.com. SNU member Mike Orchard is the moderator of this private SNU discussion group. James Lileks is an author and columnist who doesn’t know when to quit. His Bleat I’net column is a personal diary. The February 23 edition is a woulda’, coulda’, shoulda’ type reminiscence that might be aimed at us. Do we pay attention as our life goes by? Do we remember our experiences? It’s a good thing no one has invented time travel; many of us would journey back, find our young adolescent selves, and give them a stern and thorough lecture. No teen thinks their elders know the score, but I think we’d listen to our Future Self. If we only knew then what we know now! And is not only thinking about when we were a teen. Have you ever remembered a trip maybe ten, or even only five, years ago and thought about what you coulda’ shoulda’ ? Have you found that experience fading into a few little things with many many holes? So go to the farm, okay? Poke around in the barn. Ask a lot of questions. Soak it up. You’d be surprised to learn what I remember, but you’d be horrified to learn what I’ve forgotten. Make the most of your experience – both for when you have them and for later when their meaning in your life will perhaps be more significant. During the winter months you never can tell what the weather will do. Last year, the 30th anniversary meeting of the SNU had weather that kept some of the Region 12 officers on their own side of the mountain. Snow and wind and hazardous travels are why the SNU doesn’t do much for rallies in December, January, and February. But that doesn’t mean the group doesn’t get together to keep up to date with each other and take care of any necessary business. That doesn’t mean just lunch. The group tries out places with a local flavor. The Overlander is an historic hotel in Fallon, BJ’s in Sparks has won a number of BBQ awards, the Truck-Inn is a Fernley truck stop on the Interstate, and then the SNU might check out some casino restaurant just to see how the other half lives. See the photo gallery of people at lunch! The next rally is at Washoe Lake. The last SNU rally there had all sorts of interesting weather. There is a photo gallery showing folks bundled up against the weather around the BBQ pit under the gazebo along with a few rainbow pictures. You never really can tell what the weather will be – it has snowed every month of the year in Reno – so the SNU folks learn to be prepared. Ever wonder why the rivet popped? Here’s a rundown on why fasteners fail from ARP Tech. Rivets, bolts, and other fasteners can fail from one of six basic reasons. Pulling, twisting, impact, wear, faults, – see the tech terms and pictures of typical failures. In an Airstream, an occasional inside rivet popping is normal. But when popped rivets show up in a clump that means you’ve gone from normal wear and tear to some sort of unexpected stress. That stress is usually because something else is failing. Hitches, chains and related gear may also suffer failure from bumps on the road or something going awry or just not using the proper fastener for the job. What should you put in your tires? Cecil took on the question Is it better to fill your tires with nitrogen instead of air? and offered a few tidbits that make some sense. What it boils down to is that its probably not worth the effort to keep nitrogen in your tires if its not free. Good ol’ compressed air is good enough for traveling on down the road in your RV. One of the most common sources of tire failure is low air pressure. Low air means a lot of flexing and that means a lot of heat and that means material breakdowns and that can mean blowout and that can mean loss of control. There are several methods to monitor tire pressure while on the road. One is to use ABS systems to detect rotation speed changes. Low pressure can change how fast a tire roates compared to others on the vehicle. Other methods use sensors inside the tire or on the valve stem. Some even monitor temperature as well as pressure. A new federal regulation that will require tire pressure monitoring systems on new vehicles might be stopped by tire companies who say the regulations don’t go far enough in protecting consumers. The debate is about how to minimize the impact on new car prices while providing a good enough system so the tire companies can avoid inane lawsuits. Meanwhile, you can get your own monitoring system that will include the trailer tires and give you more information than just a dashboard warning indicator. If you aren’t up to the several hundred dollars for a tire monitoring system, you can do it the old fashioned way. Check tire pressures each morning before you take off on the day’s drive. Use an IR thermometer to do a quick tire and bearing temperature check every time you stop (and stop every couple of hours anyway to stretch your legs and keep alert). Be sensitive to how your rig handles and check any odd behavior immediately. Be alert and drive safe. 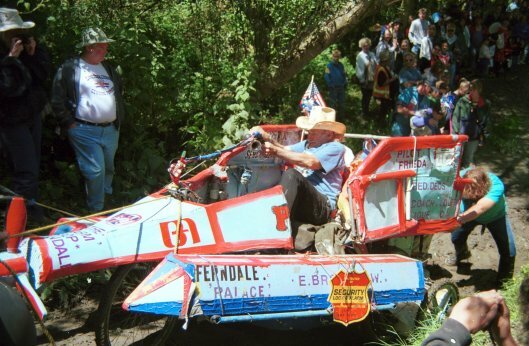 In 1969, Ferndale California artist, Hobart Brown, wanted to make his son’s tricycle look a little more interesting. The Kinetic Sculpture Race began. Other local artists decided they could make better machines and race them down Main Street in Ferndale. This was the beginning of a very successful annual event that is now copied in other states and countries worldwide. In 1998 it was going strong and had expanded to cross the bay and then up the slippery slope to the finish line. Here is a photo story of a fun event and good times. See the story with links to three photo galleries! Mace Loftus will have a 25 foot long crawl through model snake at the Wilbur D. May Museum in Reno from 3 March to 6 June 2007. See the museum website for more about the park facilities but you might have to call or subscribe to the email list to get more information about the snake show. Water is important stuff for health and vitality. It is also heavy. Adding tanks for fresh water storage and waste water has made the RV a much more modern living experience. A lot of folks are suspicious about the health and safety of their drinking water. The RV Water Filter store has some ideas about how to make it safe and pleasant to drink. You can also peruse All About Water that has ten reasons to use a water filter but no rundown on why not use one. For some common sense on storage and safety, see the Water page in the owner’s guide. For washing, take a look at washing tips for the boondocker, an owner’s guide page that has been recently updated. Or consider What Happens To Your Body If You Drink A Coke Right Now?. Another article is about climate change and the work of a local EE (retired) professor at his vacation home lake: Underwater in the Sierra Nevadas. The Baby Boom kids are out in their own RV’s with concerns about fuel costs and expectations that the Interstate Highway System makes for an easy drive from here to there. 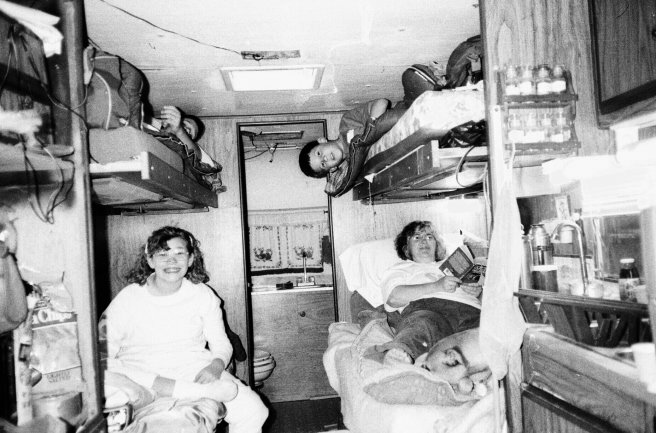 See the photo gallery for the post 70’s RV experience. NDOW had a PSA a while back about avoiding wildlife on Nevada’s roads. Most of the advice is the usual – slow down and keep a sharp eye out. NDOW puts wildlife crossing signs in places where there have been incidents. It is also interesting that the state owns its wildlife. Burros and horses aren’t wildlife, they are considered feral animals and so they are in BLM’s domain. NDOW will pick up any bighorn sheep but the rest are best left as is. “In the event of an accident involving loss of life or significant property damage, the Nevada Highway Patrol should be called to the scene.” Damage or injury might just happen if an animal is left on the road as a traffic hazard it seems. There is no penalty for accidentally hitting animals, but Dave Pfiffner, NDOW supervising game warden, reminds motorists that wildlife technically belongs to the state and should not be removed from the site. “ Nevada does not have any regulations that allow for salvage of an animal killed on the state’s roadways. Roadkill is subject to the poaching laws that apply to all game animals,” warned Pfiffner. This is eerily reminiscent of the tale of Robin Hood. 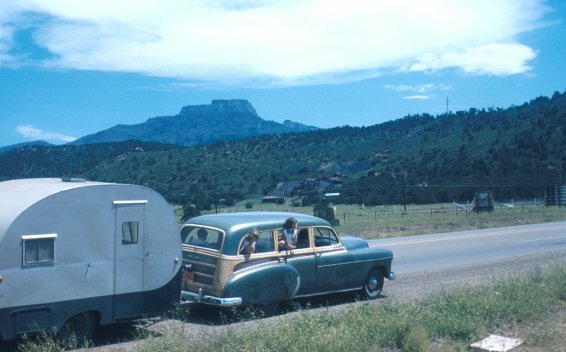 The sixties: freeways starting to become available, black tanks started to appear in RV’s, and campgrounds (like in this picture) started becoming more common. Here are some places to find out about Fernley and the Truck Inn and related stuff. Welcome to Hello Fernley! – HelloFernley.com is a website that was created for us, the community of Fernley to share information in a quick and easy manner. Local Weather Forecast for Fernley, NV – weather.com – Local Weather Forecast for Fernley, NV. Todays weather plus a 36 hour forecast and doppler radar. Fernley, Nevada, Local Weather – Current conditions, seven day forecast, weather radar and warnings for Fernley, Nevada. This is also one of the final civilization stops for the Burning Man afficianadoes (no, not the cemetary, the truck stop). To the north, along I80 is the Fernley Sink. That is beside Two Tips peak, which is at the south end of the Truckee Range and the Hot Springs Mountains. The Fernley WMA is around the sink. Camping and campfires are permitted there so we will have to check it out as a potential SNU Rally site! Fernley is the branching off point for folks driving west out pf Reno. While there is very little to the north, I80 takes off on east to Elko, US 50 heads towards Fallon, Austin and Ely, and US 95 to points south. Here’s a photo gallery of Harrison-Leipper outings 1940’s through 1950’s. This was when the highway system was well established and mostly paved but before the Interstate System. 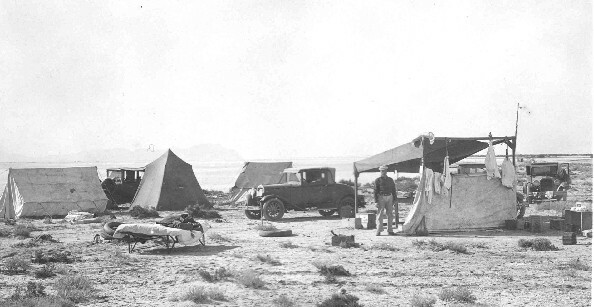 Trailers were not much more than hard sided tents on wheels. The rules for daylight savings time (spring forward, fall back) have changed. This year, DST begins on March 11, 2007 and ends on November 4, 2007. If you have one of those radio set clocks, it should handle this automatically. If you have a computer, make sure that your software has all the latest updates. Check for updates in early March to make sure you are up to date. Older systems, like Windows 98, may not have software updates available. For them, you will need to either set the clock manually or to use a utility that synchronizes the computer clock with an internet time resource. To find out what is what with DST, see the NIST FAQ on DST. For information about the time signals used by automatic clocks see the WWVB page. The internet time resources and WWVB indicate whether or not DST is in effect. The only clock settings you need to have right are the local time zone and whether or not DST is observed where you are. You may need to put your automatic clock near a window in your RV and wait overnight for it to get a good WWVB signal. Plan to attend the SNU February 17, 2007 luncheon. 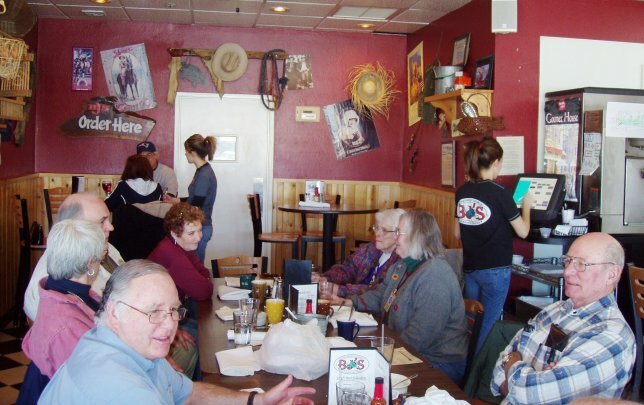 We will be enjoying the quintessential Nevada truck stop experience at our February 17, 2007 luncheon. Join us at the Truck Inn off I80, exit 48 at the East end of Fernley. The luncheon starts at 11:30 am. All members & guests welcome. There is also overnight RV parking available. Share your thoughts and ideas in the SNU discussion group now available through Airstreamforums.com. SNU member Mike Orchard is the moderator of this private SNU discussion group. Scenes from near a century ago. Check out how people dressed to go to a beach party. See what Yosemite and Sequoia looked like back then. Many of these pictures were from before the days of the highway system and pavement. John Travolta has a thing about airplanes. His acting career provided him an opportunity to exercise an interesting RV. See the photos at Jonh Travolta y sus locuras. This is a Spanish language BBS but the pictures are easily understandable. The restored 707 interior looks a lot like a modern motorhome. The home base is also one many full timers might appreciate.